This bespoke Wimbledon kitchen design incorporated a family living area and a secret door leading to a home-gym and garage space. 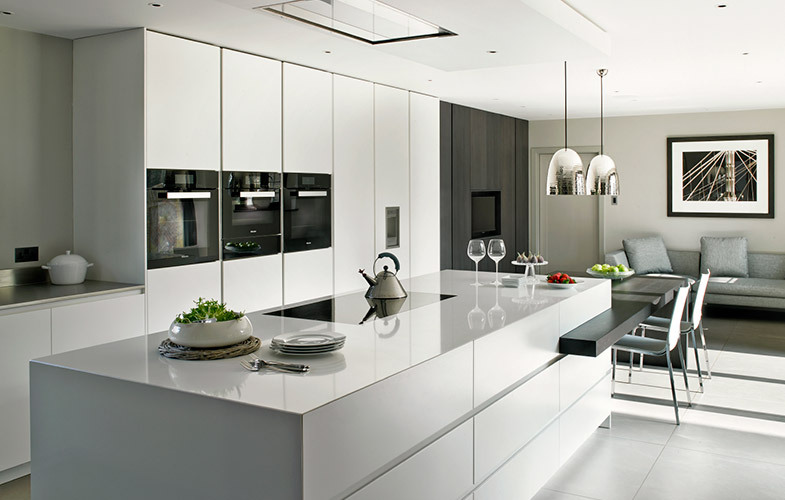 The minimalist open-plan kitchen was created with sleek white cabinets, brushed stainless steel worktops and flush fitted appliances. 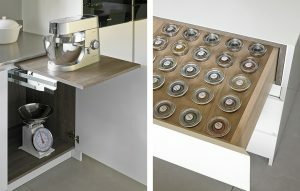 The island creates a social kitchen space. 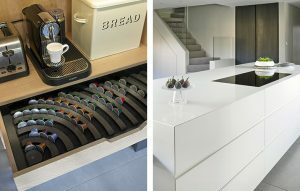 Its drawer fronts and worktops were mitred with wrap-down ends for a clean, seamless look. 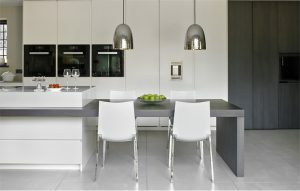 The dark stained solid oak dining table adjoined to the bright white island created contrast, a theme which was continued with the ‘secret doors’ that concealed a breakfast cabinet/larder, a tv unit and a hidden entrance through to the garage and gym. 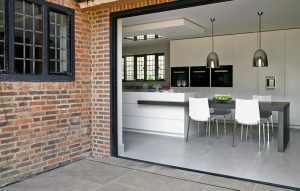 In the other direction, glass doors opened fully out into the garden to provide an open plan kitchen, dining and outdoor area for the homeowners to enjoy in the summer months. This open-plan kitchen renovation created a true hub of the home. 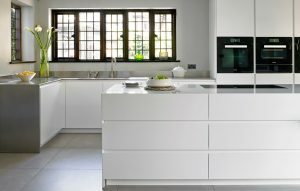 Not only did this Wimbledon kitchen offer somewhere to drink a cup of coffee and cook dinner, it offered a modern dining space, a welcoming living area and a wonderful place to entertain all year round.